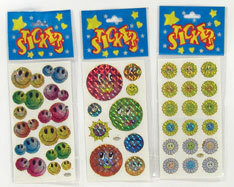 A bright, vibrant, varied assortment of stick-on smiley and funny face stickers to cheer up any paper. Sold per dozen sheets (over 250 various faces). Bagged 1 dozen. $0.85 per dozen for 150 dozen or more. $0.75 per dozen for 300 dozen or more.